Everything you need to know about Operation Protective Edge, from destroyed terror tunnels to rocket attacks on Israel. Just the facts. The IDF initiated Operation Protective Edge to put an end to the terror attacks emanating from Gaza. In the three weeks leading up to July 8, terrorists fired 250 rockets capable of reaching Israel’s largest population centers and endangering 3.5 million Israeli lives. More than half a million Israelis had less than 60 seconds to find shelter after hearing a rocket siren. Tens of thousands had only 15 seconds. The IDF initiated Operation Protective Edge in response to incessant, indiscriminate rocket firefrom Gaza directed at Israeli civilians. Terrorists in Gaza fired 3,360 rockets at Israel. 584 rockets were intercepted by Iron Dome. Before the operation, IDF intelligence assessed that terrorists in Gaza held approximately 10,000rockets. 1/3 of these rockets were fired at Israel, and an additional 1/3 were destroyed by IDF forces. On July 17, IDF ground troops were moved into Gaza to locate and destroy the underground tunnel network used by Hamas to infiltrate and attack Israel. 14 of these tunnels crossed into Israel. 2 tunnels had access points located 300m-500m from Israel. Hamas abuses the civilians and civilian infrastructure of Gaza for terrorist purposes. These abuses constitute severe violations of international law. Terrorists fired 597 rockets from civilian facilities in Gaza. 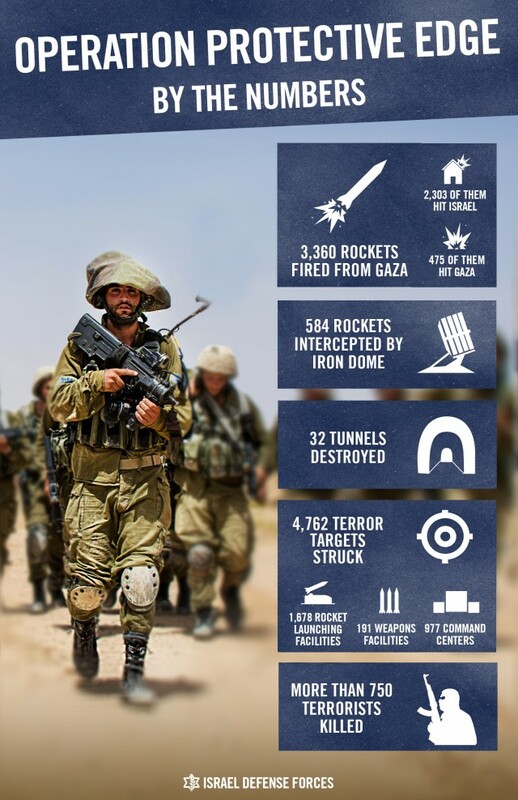 A primary objective of Operation Protective Edge was to strike a heavy blow to the military capabilities of Hamas and other terrorist organizations in Gaza and thus eliminate the threats to Israel’s national security. From July 8 to August 5, the IDF targeted terrorists in Gaza responsible for the planning and execution of attacks on Israeli soldiers and civilians. IDF forces targeted at least 253 Hamas terrorists. At least 65 terrorists of various smaller organizations. In addition, 159 terrorist suspects have been questioned by Israeli security forces. Despite Hamas’ incessant attacks, including on the Kerem Shalom border crossing, the IDF continued to transfer thousands of supply trucks into Gaza during Operation Protective Edge. The IDF transferred 1,856 trucks carrying 40,550 tons of supplies into Gaza. 1,029 tons of medicine and medical supplies. Operation Protective Edge succeeded in striking a heavy blow to terrorists in Gaza. Hamas’ underground terror network was knocked out, and quiet has been restored to southern Israel. All of Israel is now safer.